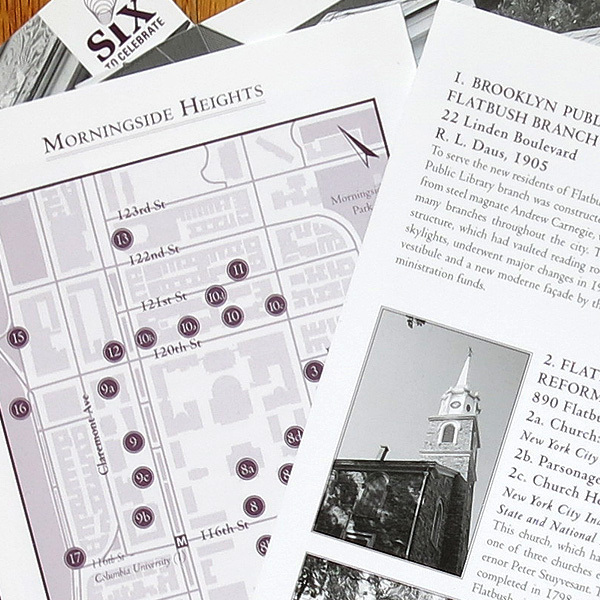 Through Lost In Brooklyn Studio, I started working with the Historic Districts Council on a wide range of print-related projects. Everything from direct mail, invitation packages, annual reports and related marketing/educational materials. I inherited an existing brand package that included an in-depth identity program and style guide. This made adapting newer print pieces easier, though I did have some latitude in interpreting the brand’s relationship to each piece. 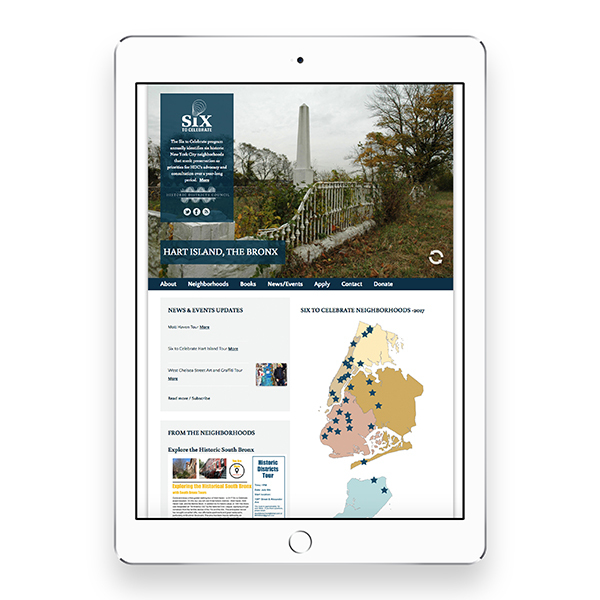 Starting in 2011, HDC began a neighborhood-specific awareness program called Six to Celebrate that included different neighborhoods from the New York City Metro area submitted by preservation-minded community organizations. From the submissions, there are six neighborhoods that are highlighted each year. HDC works with the community groups to help document the architectural character of the neighborhood through walking tours, lectures, events and neighborhood guide books. 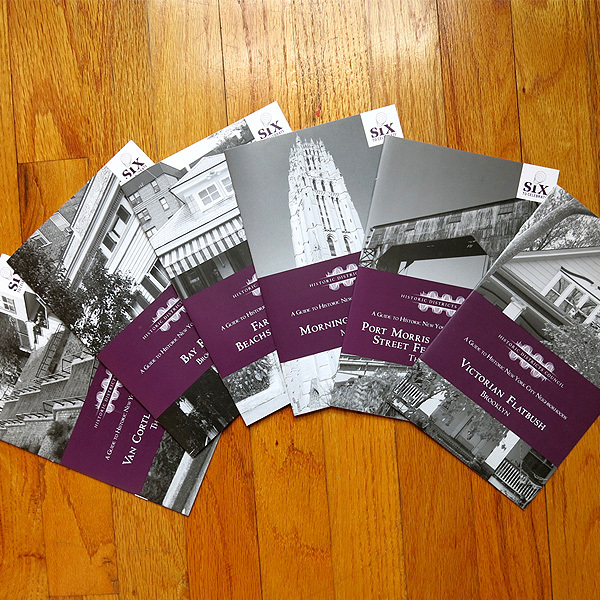 Each book highlights the most significant structures, parks and neighborhood spaces, including descriptions, photos and a neighborhood map. Upon the completion of the 2012 guide books, I began to work with the HDC and my web development partner Façade Interactive on creating a robust on-line version of the guide books. 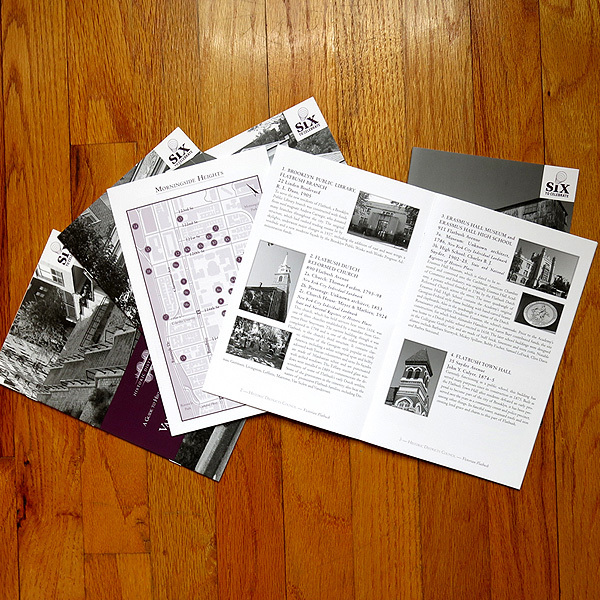 The budgetary restraints of the guide books limited the amount of text, images and additional neighborhood information. We knew an on-line version could provide much more, especially if created with a WordPress CMS. 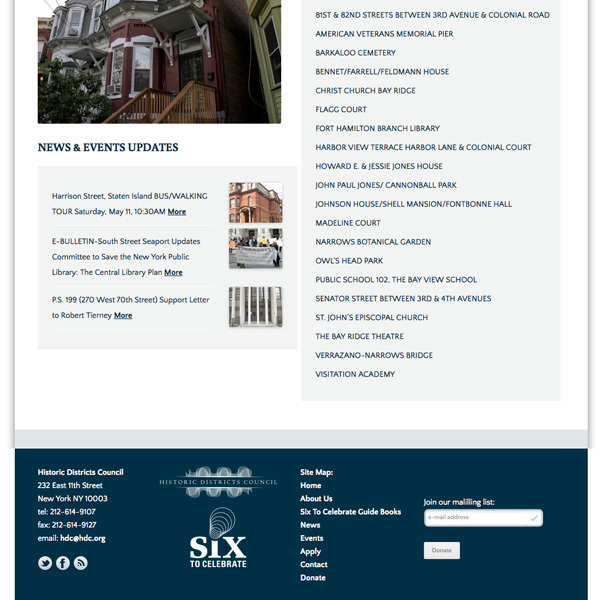 I collaborated with the HDC staff to wireframe and design the front-end; Façade interactive handled the web development. 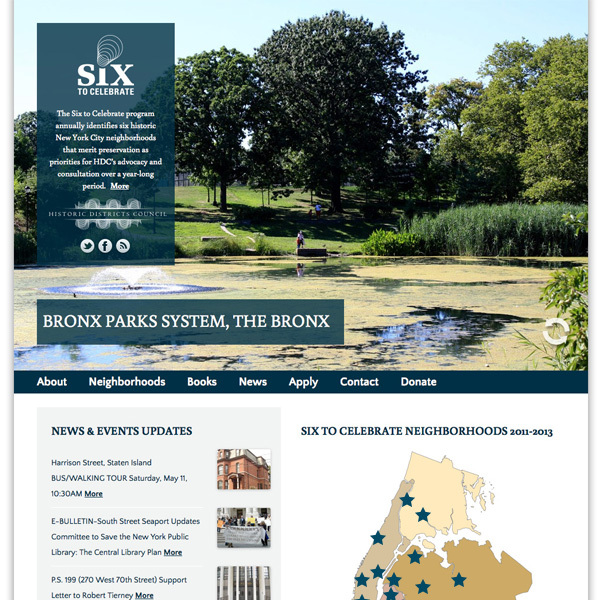 The Six to Celebrate website now presents the program in a more impactful fashion. 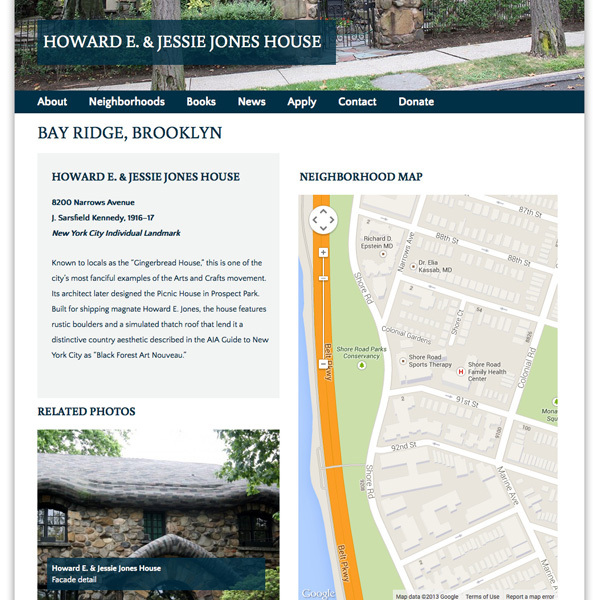 Full screen images of the specific neighborhoods and neighborhood sites are combined with additional text, photo galleries, Google maps implementation and RSS feeds from the individual community groups as well as HDC. 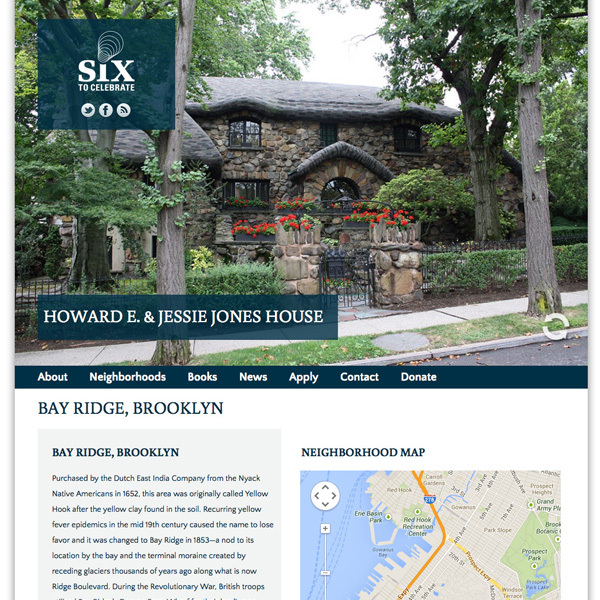 This client-updated website has created an organic and dynamic on-line home for the program.